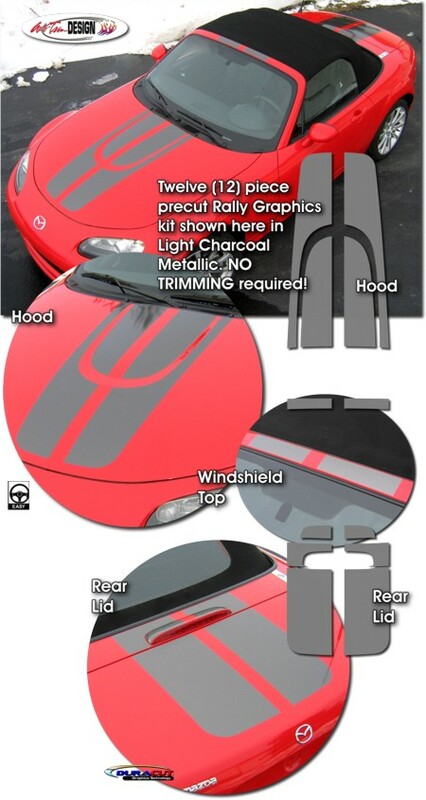 Set your '99-'15 Mazda MX-5 Miata apart from the rest with this unique Rally Stripe hood, roof and rear lid graphic kit. This easy-to-install kit is packaged as a set of eight (8) to twelve (12) pieces. They're PRECUT and ready to install in a wide variety of colors - NO TRIMMING required! This stripe package is not just a set of 9" (22.86cm) straight strips in a box. Our graphic kit consists of prefitted and contoured pieces as shown in the illustration. Kit is specifically made for the '99-'15 Mazda MX-5 Miata factory hood, roof and rear lid areas and will not fit any other vehicle. Why the unique design for the hood area? Other than the fact that it looks great, we have found that installation of vinyl graphics within indentations as found in the '06-'15 MX-5 Miata's factory hood do not hold up well due to lifting and water retention. Thus, in these situations we utilize creative solutions to enhance the vehicle while at the same time provide a graphic kit that will last for years to come. The design is merely for aesthetics on '99-'05 MX-5 Miatas. Trimmable Hardtop Kit #ATD-MZDAMTAGRPH31 consists of two (2) pieces 34" (86.36cm) in length that can be trimmed during installation for factory or after-market Hardtop applications. Trimmable Spoiler Kit #ATD-MZDAMTAGRPH10 consists of two (2) pieces 16" (40.64cm) in length that can be trimmed during installation for custom spoiler applications.